The best 3D printing projects are the ones that are both impressive and functional. While most building projects capable of movement or actions are definitely fun to make, they tend to quickly look like some cheap toy. While cool to play with, you don’t exactly put them on display in your living room. Fortunately you don’t need to spend hundreds on electronics and be an absolute CAD wizard to 3D print something that is worth showing off; just look at this gorgeous and intricate clock by Michigan-based designer and woodworker Jason Preuss. Instead of settling on function alone, he has 3D printed a gorgeous clock with a n intricate designs that not only works, but is also insanely tall (48 inches, or about 1.20 meters). It is, without a doubt, one of the most intricate and beautiful 3D printed clocks we’ve ever seen, and definitely the largest. As Jason explains to 3ders.org, he has only been 3D printing for about two and a half years now. Having a background in woodworking, however, quickly inspired him to use this new technology to also build a clock. "I first thought of the idea when I took a local 3D print and design class two and a half years ago. The teacher was showing how to convert a picture into a 3d print using Blender and it got me thinking about the scroll saw wood patterns in the past I had cut," he reveals. But as many of us have experienced ourselves, having an idea is one thing – executing it is an entirely different step. "It took me a solid year to both get a process down and to get my 3D print skills good enough to print my first clock, the dragon clock," he adds. This clock was originally designed as a wedding present for his sister and brother-in-law. The Dragon Clock: Jason's first succesful attempt at clock printing. But why only 3D print for someone else? "After I had given that one away I decided I wanted a clock for myself. In October  I knew I wanted to go to the Midwest RepRap Festival(MRRF) and decided I wanted to go all out on a project to bring," Jason explains. In the end, he settled for one of the most advanced patterns in woodwork clock-making: the Dome Clock. Due to its highly complex nature, it took Jason months to create the 3D designs for the clock, basing himself on patterns used in woodworking. These plotter-sized pattern pieces were scanned into Inkscape, where he was able to do things like add bevels before sending the pieces to OpenSCAD. "It took from October to early January to scan in all the patterns and turn them all into 3d models. Then it took most of January and February to print out all the pieces, with some reprints in March on parts with problems," Jason added. During this entire 3D printing process, the Dome Clock consumed more than 6 kg of PLA filament, spread out over 120 different components. Total printing time has clocked in at 345 hours using his modified Replicator 2 3D printer. Glueing everything together the weekend before the Midwest RepRap Festival, Jason was just in time to take it to the convention. Printing at a 20% infill, the clock is a massive 48" tall and about 24" wide (or about 120 x 60 cm). While the clock itself is truly amazing and inspiring, the mind quickly wonders to Jason’s approach turning woodcutting designs into 3D printable format. For those of you wondering if those can be used for more applications of 3D printing, the answer is yes. While Jason hasn’t yet had the time to document his entire design process, he fully intends to do so for his own website and has kept plenty of notes for that purpose. However, Jason is already confident that a lot more can be done in this fashion. "I think that scroll saw patterns are a great source for interesting prints (several people at MRRF mentioned doll houses). There is a wood cutting method called compound cutting(cutting the wood from two different sides) that can take a very simple pattern and turn it into an interesting print, for example [this Christmas Tree Ornament]," he says. While we will thus have to be patient while Jason prepares a more detailed guide for transforming woodcutting designs into 3D printable files, its great to hear that this branch of design holds far more treasures to recreate with a 3D printer. Jason even believes it's a great way to become familiar with 3D designs without first learning the ins and outs of CAD software. "I think this could be a way for people to do 3d designs without having to learn a CAD or graphics program just by hand drawing and scanning. I have taught a couple 3D classes at my daughter's elementary school and to be able to turn a drawing into a print was something the kids really liked," he says. In the meantime, you can try your hand at the somewhat smaller Dragon Clock Jason made for his sister’s wedding. He has already made its stl files available on Thingiverse here. 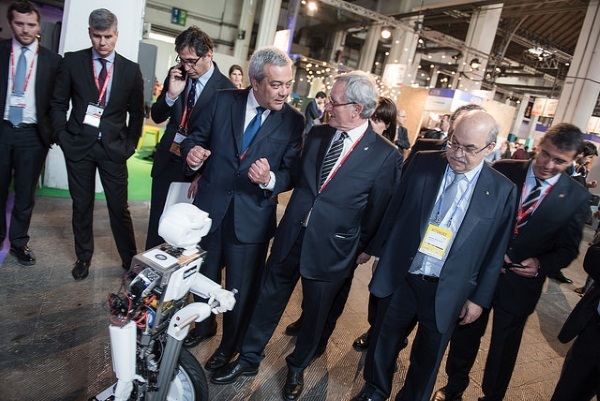 At the 4 Years From Now convention in Barcelona, the 3D printed Humanoid Robot developed by Robosavvy was a big hit. And it’s no surprise: When your robot is 3D printed, drives a Segway, and can be controlled by an Oculus Rift headset, heads will turn and water coolers will be populated by pointed conversation. Robosavvy distributes and resells robotics and 3D printing technology, and focuses on producing custom robots for anything from research and engineering, to live events and television appearances (IBM’s Watson just got nervous). Their robot happily greeted the over 5,000 visitors to the Barcelona show, further demonstrating the interplay between humans and robots that is the subject of an ongoing university project. The robot isn’t entirely 3D printed of course, since 3D printers can’t print all of its features, such as its 30 motors and an i7 computer. Both exterior (head, arms, and hands) and interior (electronics trays) components were 3D printed with a Makerbot Replicator 2x. This is something you have to see to believe. And you can actually see what the robot sees by watching it through an up-linked Oculus Rift headset. The base of the Segway is standing on a modified self-balancing platform which is remote controlled by the user. Robots replacing humans is seen by some people as a negative aspect of an approaching dystopian future, and I can see their point. However, jobs that require individuals to learn how to build, maintain, and innovate with robots will be on the upswing, so it’s time to hit the books. 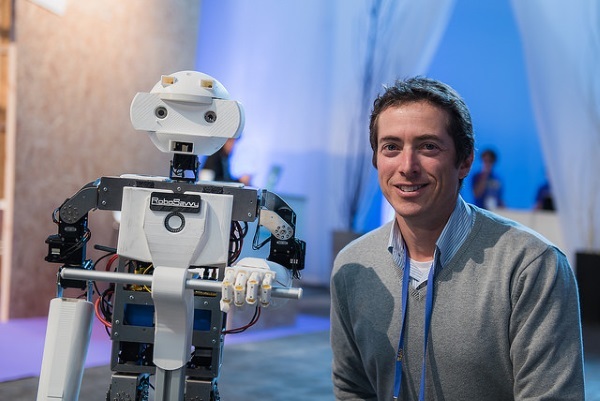 Robosavvy’s 3D printed humanoid robot is a prototype, but bringing it to the 4 Years From Now convention in Barcelona made it a showpiece indicative of a future that is, of course, not set in stone. But, yeah, robots are going to replace humans. And then maybe, they’ll present a genetically modified human at a conference and a world populated mainly by robots. I had the chance to ask Limor a few questions via email, and he was kind enough to reply. Thanks Limor. 3DPI: How were people interacting with the robot in Barcelona? Limor: People were amazed by the magic of the robot riding a segway. Every VIP delegation was chaperoned to our area and every media correspondent took the time to film and ask questions. People did selfies with the robot. 3DPI: Where do you think robotics and 3D printing are headed in the near future? Limor: Robotics projects be it with commercial, education and fun intentions are booming thanks to desktop 3d printers, alibaba, crowd funding and of course random acquisitions by Google. This environment encourages creativity and entrepreneurial risk-taking. Desktop 3d printers allow quick access to CAD designed parts that serve as mechanical structure or connectivity in an assembly. doing mechanical structure prototyping is exponentially accelerated thanks to 3d printed parts and ebay/alibaba cheap industrial components. 3DPI: Where do you see Robosavvy in 3-5 years? Limor: Our retail business continues to grow every year and we manage to always keep ahead of the game sourcing cutting edge robotics related products and components catered at the hobby tech connoisseurs, education and research. Our lab is maturing and getting more demanding projects. We plan to roll out several significant mobile robotics projects for domestic and commercial uses. So in 3-5 years our brand will hopefully be a household name in the upcoming personal robotics market.